Ben Whiteman admits Darren Ferguson was right to drop him not long after signing him on a permanent deal. And the former Sheffield United midfielder - who has impressed upon his return to the starting line-up - feels he benefitted from a spell on the sidelines. Whiteman, 21, will almost certainly be in the Doncaster Rovers side hoping to bounce back from defeats against Oxford United and Blackburn Rovers at Oldham Athletic tomorrow. After making his loan deal at the Keepmoat Stadium permanent in January, Whiteman found himself warming the bench for the majority of February and March. But having reclaimed a shirt he is currently pleased with his form and reflects favourably on his first full season playing in League One. “I’ve developed massively as a player since I’ve been here,” he said. “That was one of the reasons why I signed permanently in January. I just wanted to kick on. “I wasn’t really up to my own standards for probably about a month after I signed. “I spent a little bit of time outside the team, which was deserved. I spoke to the manager about it and he was right to leave me out of the team. “Since then I’ve come back into the team and I feel I’ve done well. “I felt I really needed that little bit of time out just to reflect on my performances. 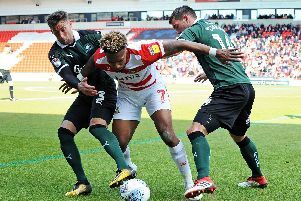 Rovers’ first back-to-back league defeats since September have derailed what was previously shaping up to be a strong finish to the season. Whiteman admits there will be disappointment among the group if Rovers, who currently sit 14th in the table, do not finish in the top half. But he is not concerned about the level of performance going into this weekend. “I thought we played okay against Oxford and got done on the counter attack, which we knew they had in them,” he said. “Blackburn was a different story. They’ve been promoted for a reason, they’re a really good side. “They had chances and we had our chances, but Blackburn showed why they’re going up. “I thought it was a great performance by us and it was disappointing to concede from a set piece. Hopefully we can take that into the weekend now. “I don’t think it really matters that Oldham are fighting for their lives. If we implement our style on the game we’re a close match for anyone in the league.